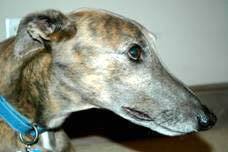 Stanley is a 7½-year-old blue brindle male greyhound, born in April of 1997. 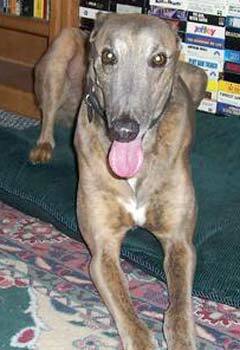 He is best friends with George, as they were adopted from the same racing kennel in CT five years ago. Their former owner has been transferred out of the country, so they are looking for their REAL forever home. Stanley is the follower and George is the leader - they get along well with other dogs, but it is not known at this time if they are cat tolerant. They are a package adoption, as we don't want to split them up after being together for these many years. George and Stanley are adjusting to their foster home beautifully! These boys are a matched set and have a wonderful relationship due to spending their first 5 years of "retirement" together. 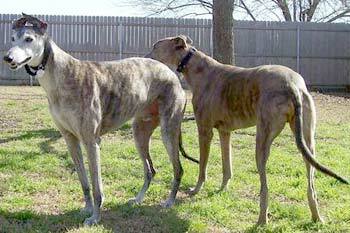 George is a black brindle, born November, 1996; Stanley is a beautiful smoky blue/tan brindle, born April 1997. George is adventurous, affectionate and curious. He likes to vocalize, and tries very hard to explain to me exactly what he's thinking. His ears are adorable: one up and one down! Stanley is happy to let George check out all the new sights and sounds, and is just as loving. Stanley likes to see what George thinks before he tries anything new, but also likes to get my reaction as well. His eyes are so expressive, its as if he's trying to communicate with his gaze. Both are excellent leaners, and love getting and giving affection. George feels the need to sleep on my bed at night (he's a BIG boy, so his new family will have to understand!) but Stanley prefers to nap on my bed during the day when he can have it all to himself. Both are house-trained and have not had any markings or accidents in my house. George loves the dog door; Stanley is adjusting more slowly to it. They eat side by side, and tend to stick together when out in the back yard. They pay no attention to my alpha female's loud verbal threats when they get too close to her as she's devouring treats. They just walk by as if she's not there. These boys are exceptionally gentle and affectionate with children. George and Stanley are extremely calm, sweet, loving boys who need to find a family who can open their hearts wide enough to accept them both. If you are thinking about adopting two at a time, these gentle giants are the ones for you. No need to figure out who will get along with whom, George and Stanley are already perfect together. Now they need to find a home that is perfect for the two of them.